Venopi: Venopi loves Day Made! 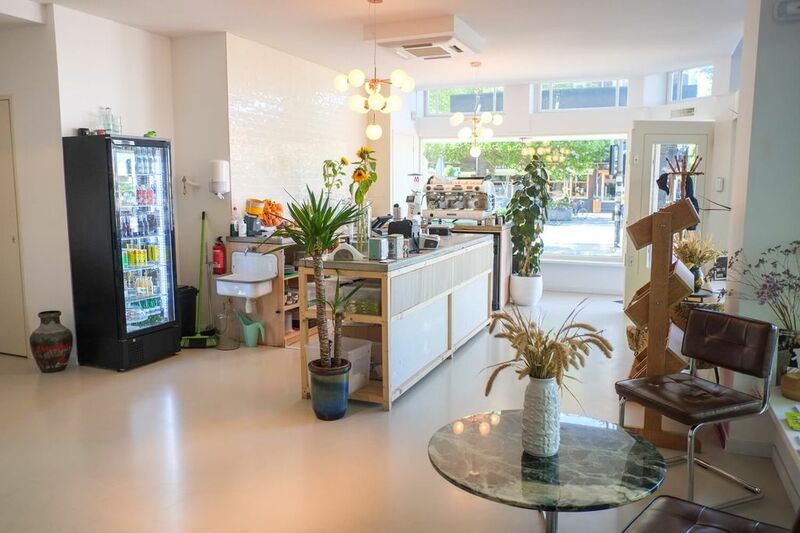 This week we are featuring the latest listing on Venopi, Day Made, a specialty espresso bar and gallery located on the corner of Jan van Galenstraat and Willem de Zwijgerlaan in Amsterdam West. Inside the espresso bar and gallery is light, spacious, and organic venue that could be the perfect location for your next event! Once you step through the front door, you enter a bright and airy space surrounded by windows. The overhead light fixtures of opaque bubbles hang over the counter at the backdrop of a white tiled wall creating a clean atmosphere. Along the wide window sills, you will find plants (the largest of which even has a name, find Wout in the corner) and pamphlets providing information about what is going on in the neighborhood. The striking accent wall brings energy and beauty into the room. The space has two tables that can be rearranged to suit the purposes of your workshop or meeting, or totally cleared to make space for a yoga session. Have another idea of what would work in this space? We are open to suggestions and we welcome innovative and unique ideas. 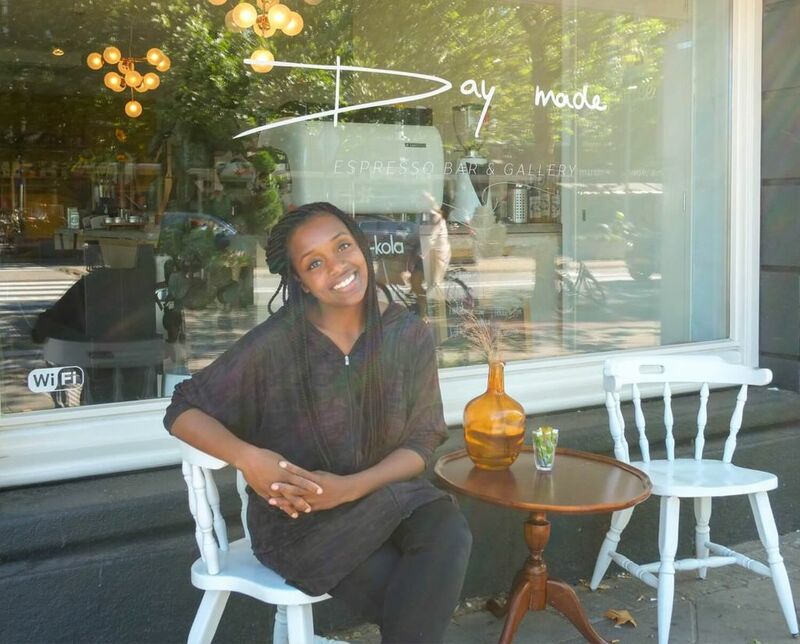 Meet the lovely Naraisa Mac-Intosch, owner of Day Made, which opened in 2017. According to Naraisa, there was previously an xtc-lab in the basement of the building and the neighborhood residents are pleased to welcome the change. In an effort to combine her two passions, coffee and art, Naraisa created Day Made. Featuring the artwork of local artists on the walls, Naraisa wants to support members of the community. Additionally, Day Made supplies the Amsterdam brand Moyee Coffee, “the World’s First FairChain Coffee,” which seeks to establish a fairer distribution of returns in the production chain. Day Made functions as the living room of the neighborhood and the visiting friends and neighbors create a real sense of community. 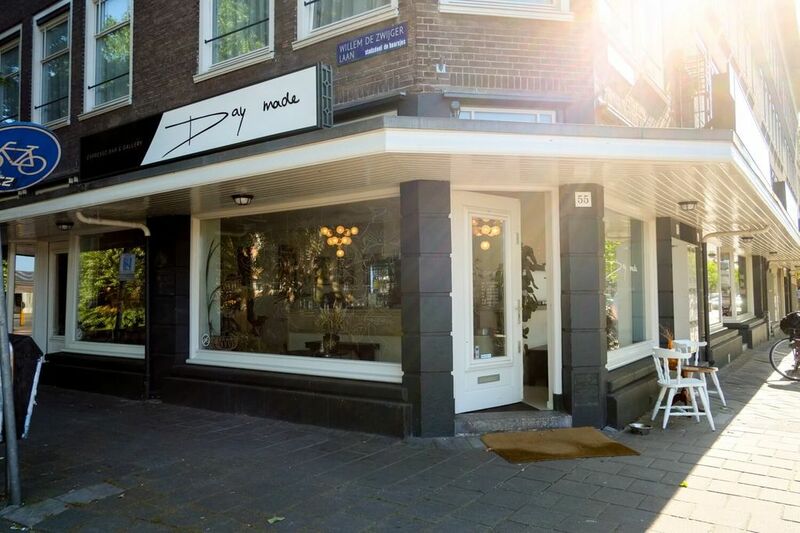 Each month, Day Made hosts Bedrijvige Vrouwen, a network for over 1,700 female entrepreneurs in Amsterdam. The organization aims to strengthen the economic position of entrepreneurial women through social cohesion. 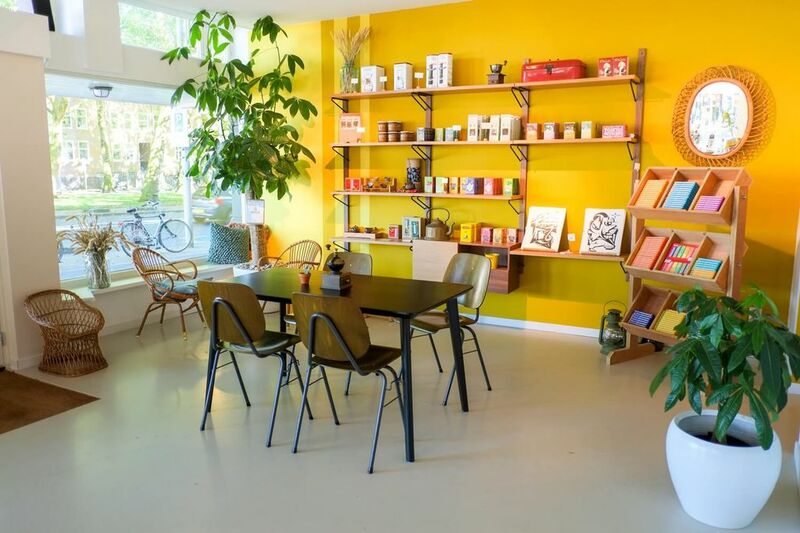 Part of what we love about Day Made is their commitment to improving the area by connecting people in a sustainable way and contributing to the growing sharing economy in Amsterdam. The success of a sharing economy has wider implications beyond business transactions -- it is about cultivating a mindset of community enrichment and creating a better quality of life for all. Fostering cooperation through multi-purpose spaces, Venopi’s online marketplace allows people to access places and connect with their neighbors. Technology has become a tool for sustainability -- it enables people to easily connect with each other, gain access to spaces, and share resources. The sharing economy model can allow people to afford something that would otherwise be out of their price range and could be the beginning of a more communal-living movement. Are you looking for a creative space for your next event and would you like to support the sharing economy movement?